I've been enjoying a few stories set in my go-to era, Regency. If you like this period in history and are looking for good fiction to curl up with in the coming months, I highly recommend Kristi Ann Hunter's books. I recently finished her Hawthorne House series and it was outstanding! You've seen a few reviews on here, I'm sure! 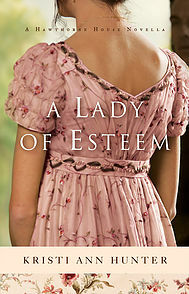 :-) The first story, which is A Lady of Esteem: A Hawthorne House Novella, is FREE on Kindle. Click here to go to Amazon to grab your copy. Double check the price before you buy! 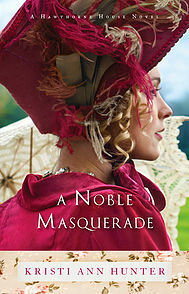 That brings me to the first full-length book in the series, A Noble Masquerade. When Marlow accidentally discovers and mails one of the letters to her unwitting confidant, Miranda is beyond mortified. And even more shocked when the duke returns her note with one of his own that initiates a courtship-by-mail. Insecurity about her lack of suitors shifts into confusion at her growing feelings for two men--one she's never met but whose words deeply resonate with her heart, and one she has come to depend on but whose behavior is more and more suspicious. When it becomes apparent state secrets are at risk and Marlow is right in the thick of the conflict, one thing is certain: Miranda's heart is far from all that's at risk for the Hawthorne’s and those they love. GIVEAWAY: I have a gift certificate for a Kindle copy for one of my readers. Just leave a comment in a non-spam format (jane[at]doe[dot]com) telling me your favorite dish to prepare for Thanksgiving and you will be entered in the drawing. Following the blog is not required but it is greatly appreciated! Since it's an e-book, as long as you know can retrieve it, it's open internationally! I'll draw a winner on Nov 14. Sonja, I love Green Bean Casserole! Do you put french fried onions on top? Hey Paula, I make Sweet potato Casserole the same way! Love the pecans and brown sugar on top. I can't wait for the next series either! Kristi quickly embedded herself in my heart as one of my favorite Regency authors. Corn bread dressing. My daughter makes late mother in laws and it is always great. Oh yes! My momma always cornbread dressing and it's my favorite dish too. Lisa, PLEASE come back and leave an email so I can contact you if you win. I've spent time this morning enjoy your blog. Such encouragement in your words and lovely inspiring images.This book has been added to my list. Enjoy this time of Thanksgiving.